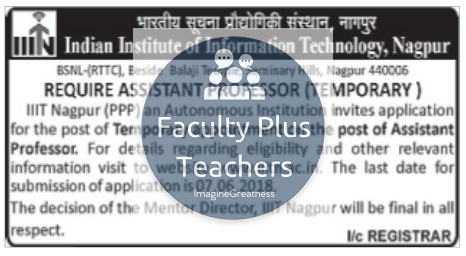 Indian Institute of Information Technology, Nagpur has advertised in THE HITAVADA newspaper for recruitment of Teaching Faculty- Assistant Professor jobs vacancies. Interested and eligible job aspirants are requested to apply on or before 07th June 2018. Check out further more details below. About College: INDIAN INSTITUTE OF INFORMATION TECHNOLOGY NAGPUR (IIITN), is one of the Indian Institutes of Information Technology (PPP) in the country, set up with the objective of making available facilities for higher education, research and training in various fields of Information Technology. To address the challenges faced by the Indian IT industry and growth of the domestic IT market, the Ministry of Human Resource Development (MHRD), Government of India intends to establish twenty Indian Institutes of Information Technology (IIIT), on a Not-for-profit Public Private Partnership (N-PPP) basis. with CGPA of 6.5 or above in 10 point scale and ME / M.Tech in relevant discipline with first class or with CGPA of 6.5 or above in 10 point scale and Ph. D in relevant discipline from reputed University / Institution. above in 10 point scale and Ph. D in relevant discipline from reputed University / Institution. (C) M.Sc with first class and Ph.D in relevant discipline from reputed University / Institution. Desirable : Quality publications in SCI/SCIE/ Scoups Index Journals .